It’s no surprise that this week’s Pin of The Week was repinned. I mean, it’s a hot pink chair! Who doesn’t love a pink chair? OK – maybe the men in our lives don’t but I’m here to fight that notion. Look at this pic. Sure, the chair is pink but the rest of the room isn’t. Those grey walls and black desk are totally gender neutral. Quite simply, pink makes people happy. So, here’s my challenge to you: Show me the man who has lost his masculinity by having a pink chair in his house. What? You can’t find one? Yeah – I didn’t think so. I saw my gorgy Pin of the Week on Mimi + Meg but it’s originally from a High/Low feature in Style At Home. Can you guess if this is the high or the low? 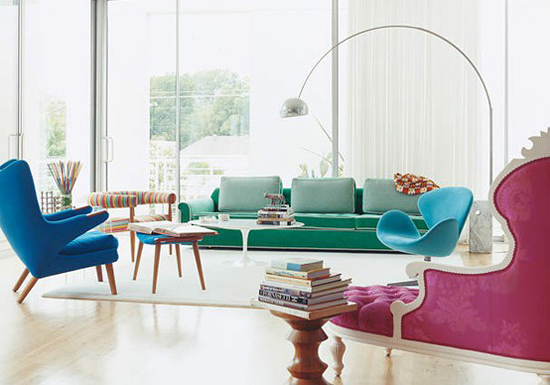 Let’s take a look at some more pink chairs and sofas (and even a bench and table combo). Do you love them? Are you brave enough to put one in your home? I saw this baby on Small Shop in a guest post from Amelia of Colour Bloc. While zipping through the hundreds of blogs on my Google Reader, this image stopped me in my tracks. A pink chair does it every time! 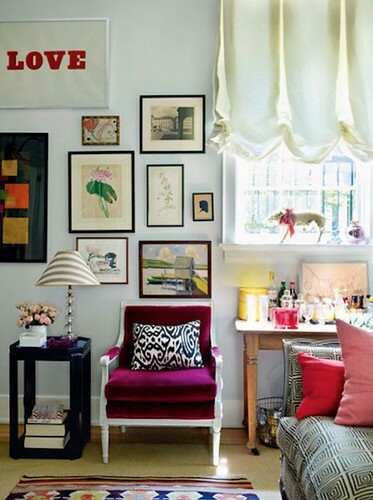 Love the nailhead wall and the almost highlighter tone of the chair. This is an oldie from my Pinterest board and the link isn’t working anymore (anyone know the source?) but I had to include it. Those chairs really warm up a somewhat cold space. Sidenote: check out that 2-way couch. Great for entertaining but not much else. Rita Konig via The Estate of Things‘s one simple magenta chair surrounded by a fabulous gallery wall and a gorgeous bar table is well…nothing short of spectacular. I got it at PB Teen a few years ago and sadly they don’t make it anymore. When I bought it, the slipcovers were on sale so I got three of them: white, pale pink and pale blue. I figured I could use the chair in one of the kids rooms in the future but the colors of the slipcovers are all wrong. So, I’m thinking: could I get brave and dye the light pink slipcover darker pink? I mean, it’s sitting in a bin in my make-shift linen closet so why not? And if it comes out horribly, I still have the white one that I love. Update: I did it! I dyed the slipcover! And it’s EPIC! Check it out here. Please follow me on Pinterest to see all the pining fun! P.S. What do you think of my new header? Too much of the kid’s rooms? Please let me know in the comments! 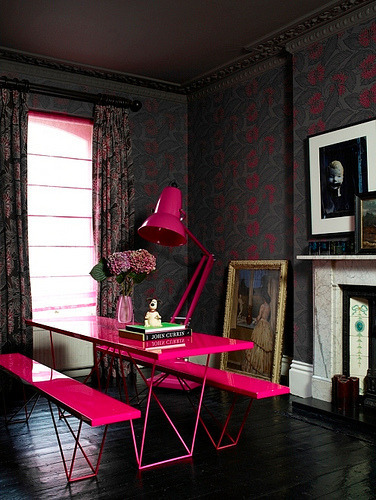 I definitely need a pink chair in my life – STAT!!!!! Looks like a man cave to me!!! Where did the cream slip cover come from please?